The law firm of Harfenist Kraut & Perlstein LLP represented plaintiff, Martin Tretola; who prevailed in a lawsuit for violation of his civil rights. 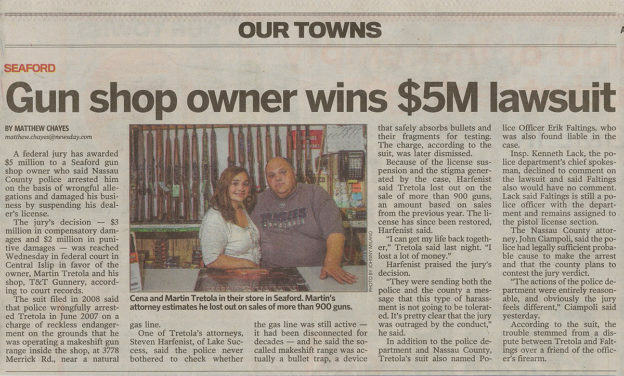 The jury awarded Tretola, the owner of a gun shop in Seaford, Five Million ($5,000,000.00) Dollars in compensatory and punitive damages. The jury determined that Tretola, who was arrested on June 1, 2007 by Nassau County Police Officer Erik Faltings, had been wronged when Faltings arrested Tretola and accused him of a felony – Reckless Endangerment in the First Degree. The charge was based on Faltings false claim that Tretola was operating a “makeshift gun range” in the shop where Tretola performed gunsmith repairs. The Reckless Endangerment charges were dismissed outright against Tretola by the Nassau County District Attorney in 2008 and charges filed by the Town of Hempstead were also dismissed after trial in 2008. Officer Faltings, who works in the pistol licensing section of the Nassau County Police Department, had a disagreement with Tretola some months before the arrest. The disagreement began when he asked Tretola, by telephone, to release a handgun for a customer without what Tretola believed was the required paperwork for the release of the gun. Tretola refused to release the gun without the proper paperwork. The false arrest was predicated on Faltings’s claim that gun repair and testing took place near an “active gas heater.” The “active” gas line in reality was just a pipe that had been inactive for decades – something Faltings and other members of the Nassau County Police Department who raided Tretola’s store admittedly never even bothered to check. Faltings and the County of Nassau were represented by the Nassau County Attorneys’ Office. The case was tried before the Honorable Denis Hurley of the United States District Court for the Eastern District of New York.